Faces, Hidden and Revealed – Held Over! There’s a couple of twists to the annual mask and puppet show this year at Gallerie Karon. We’ve added portraits to the mix. That area will include work by Robert Paulmenn, Pam Danielle, Brooks Garden Hauschild and Richard LeVitt among others. 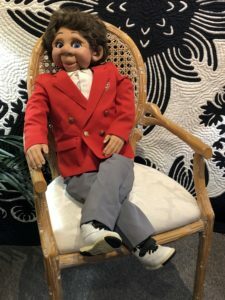 The most unusual offering is from a private collection of vintage ventriloquist dummies. It’s rare to see a grouping like this and all for sale! Hand puppets are also in the evidence and many, many animals are represented. Other puppets are stringed marionettes.